As one of the ‘big 5’ of the Haro Barrio de la Estación, next door to Muga and opposite Tondonia, this is one of the benchmark producers of Rioja Alta wines, which it was a pleasure to visit in 2018. The bodega controls 415Ha of vineyards in Rioja, under the La Rioja Alta label. In 1995, they acquired Torre de Oña, a 44Ha single estate near Laguardia in Rioja Alavesa. They have positioned this second brand as their modern-style Rioja, producing 4 wines. But the Group has looked beyond the boundaries of Rioja too, planting 87Ha of Tempranillo in Ribera del Duero to make 2 wines under the Áster brand. Initially, this included an estate Reserva with American oak, but they realised French oak worked better, so dropped the Reserva and now have only an estate Crianza, plus a single plot Reserva – Finca El Otero. 75Ha of Albariño was added in the O Rosal region of Rías Baixas to make wines of the Lagar de Cervera label. This latter estate is now the Group’s white wine, replacing historic production of Rioja Blanco. Within the La Rioja Alta brand itself, the hierarchy begins with Viña Alberdi which is a relatively volume Reserva, and which is the mainstay of their Spanish sales. Next are a pair of Reservas, Viña Arana and Viña Ardanza that are matured for longer periods and come in €5 and €10 / bottle higher in price respectively. With 20% Garnacha, Viña Ardanza particularly is a benchmark for traditional Rioja, often used in the MW exams as such. It is also their largest volume brand at 500,000 bottles. In 3 vintages – 1964, 1973 and 2001 – this has been released as a Reserva Especial, reflecting the supreme quality of these years. I bought and have drunk a lot of the 2001! Barrels are clearly an important part of the La Rioja Alta style. 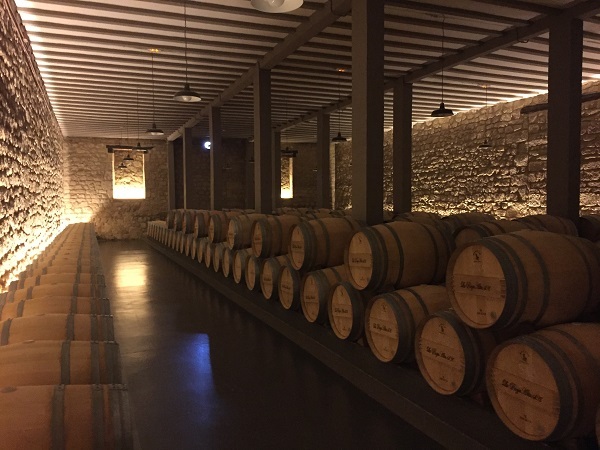 La Rioja Alta have 30,000 American oak barrels, and they import the oak already 2-years seasoned, then have an external cooperage build them new. La Rioja Alta’s in-house coopers repair, but don’t build new. Torre de Oña does have some American oak, but its profile is more heavily focused on French oak, alongside some Russian oak from the Caucasus. Áster is exclusively French oak, up to 2 years of age. Maturation times are equally key. 890 will typically spend 6 years in barrel and 6 years in bottle, while 904 is a shorter 4 and 4 profile, both of which comfortably exceed Gran Reserva requirements. Indeed, Viña Ardanza and Viña Arana, though Reservas, would now qualify for Gran Reserva status given their lengths of total maturation. 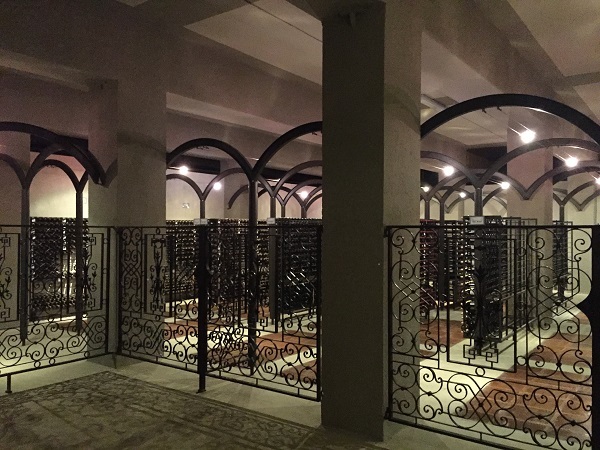 This means a lot of storage, given that the Group sells 3m bottles a year – 9m bottles maturing in the bodega (including a wine library reserve established in the 1980s) plus 30,000 barrels equates to 8 years’ production in stock. With such extensive maturation, management of O2 has become a priority for the winemaking. An important stage that they are going through is to measure oxygen across each stage of production, to understand how much is introduced into the wine as a result of current production methods. From that knowledge base, processes can be altered to manage oxygen uptake better. Nevertheless, barrels are already topped-up monthly to fill ullage and reduce oxidation, whilst traditional cloth and wood bungs have been replaced by silicone both for better seals and to reduce contamination. Barrels are racked every 6 months, not only to clarify the wines, but also to provide Quality Control analysis points on an ongoing basis. Given that measured oxidation is a component of creating the style of the house’s Rioja Alta wines, this commitment to future quality through controlling that process more tightly should only serve to drive their already high standards higher. From a commercial perspective, it’s interesting to see where the different brands are stronger. 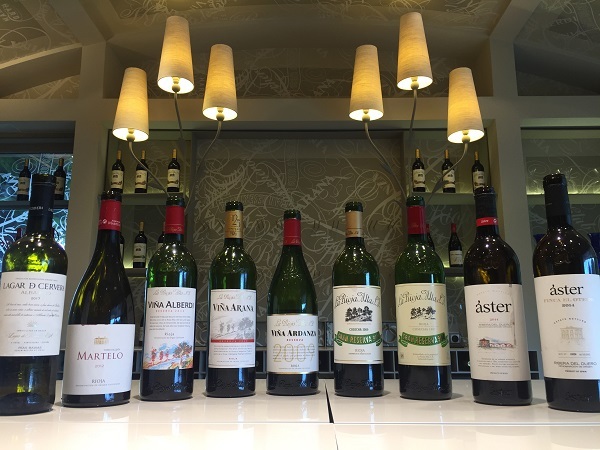 The Áster Ribera del Duero brand apparently sells well in Asia and the US, as well as to European locations with substantial Spanish ex-pat communities, while La Rioja Alta is mainly in the UK and US. In the UK, the brand positioning is very much upmarket, meaning they don’t sell into supermarkets, and focus instead on independents. Its largest outlet is Majestic, particularly for Viña Ardanza. Restaurants and high-end wine bars are the on trade focus for visibility, and apparently that delivers good off-trade follow-up. In 2015, they were heading to London Wine Fair with UK agents, Armit. The 3 days were good for on-trade sales, but at £25,000 then for a stand for 3 days, it becomes hard to justify the wine fair, versus spending the equivalent on doing road trips around the country. A fair challenge! In the US, they have as many as 20 importers, due to the high levels of regionality in US distribution (like Germany), with particular strength in New York City. In less well known markets, such as South Korea, critics’ appraisal has been key to getting access. 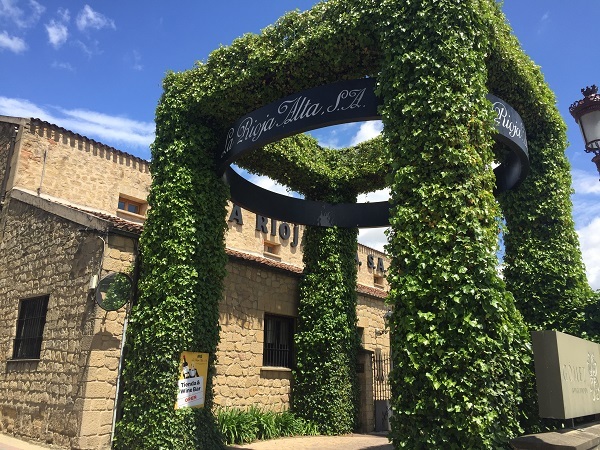 These days, the Rioja Alta brand at least opens doors, even sales don’t immediately follow. The tasting notes below combine an extensive tasting of their portfolio at the bodega in 2018, with a previous wine dinner and other tasting opportunities. MLF in most years to reduce acidity, but not in 2017. Tasted at 2015 wine dinner. 10% MLF to manage acidity. P: Mineral salty touch. White peach and gentle citrus. Light-medium body. Crisp. No lees? New addition to Torre de Oña range. Intent to rediscover the Alavesa style with a field-blend. 90% Tempranillo, 10% Garnacha, Mazuelo and Graciano. 600m altitude, chalky-clay, poor soils. 22 months in 80% American and 20% French oak. MLF in the American oak portion. Tasted at 2015 wine dinner. Rioja Alavesa single vineyard. Rioja Alta’s modern-style label. 2 years in French and Caucasian oak, then 2 years in bottle. 95% Tempranillo, 5% Mazuelo. More powerful and dark fruit typical of Alavesa. N: Torrified. Oak spice, earth, Marmite. Black fruit. 200-250,000 bottles a year. €10 / bottle in Spain. 1 year new American oak then 1 year in 2 year old American oak. 100% Tempranillo. €15 / bottle in Spain. UK and Northern Spain are main markets. 3 years in oak. 95% Tempranillo, 5% Mazuelo. €20 / bottle in Spain. 500,000 bottles production and the largest brand in the portfolio. 3 years in oak. 80% Tempranillo, 20% Garnacha. Tasted at 2015 wine dinner. 80% Tempranillo, 20% Garnacha. Red fruit profile. 3 years in barrel and 6 in bottle. €35 / bottle. 90% Tempranillo, 10% Graciano. Start fermentation at low temperature, then build up to get fruit and colour. 4 years in barrel and 4 in bottle. Second bottle to check condition of first. Tasted at 2015 wine dinner. 1904 first vintage, but the 1 at the front confused consumers with a vintage date. 4 vintages / decade. 90% Tempranillo, 10% Graciano. 4 years in barrel and 10 in bottle. 7-8Ha parcel. 750-800m altitude on sandy-clay soils. 100% Tinta del País. 15 months in new French oak, including MLF. 55,000 bottles. €25 / bottle. 22 months in 2-year old French oak. 150-200,000 bottles / year. €15 / bottle in Spain. Tasted at 2015 wine dinner. 95Ha single estate at 800m altitude. 100% Tempranillo. Pre-harvest from 12 to 7 bunches per vine. Harvest 5 bunches / vine. 4-4.5t / Ha vs 6t / Ha typical regional yields. 18 months in new French oak, then 2 years in bottle. Barbera d’Asti and Nizza: finest Barbera?